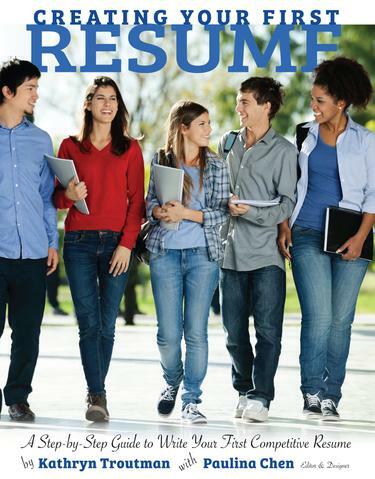 Creating Your First Resume is used at high school and technical school programs nationwide. The new edition boasts brand new resume samples that represent the push toward STEM technical programs to provide training and certifications for high school students. In addition, the new book offers many realistic resume samples that will help students of all paths write a first resume that fits their needs. Creating an attention-grabbing first resume is the best thing you can do for your future, and we will show you how to do it! This straightforward guide takes you through each level, from starting your first draft to talking with your new employer about your job offer. KATHRYN TROUTMAN is the leading expert in federal resume writing. President of The Resume Place and creator of the Ten Steps to a Federal Job, Kathryn is an highly-recognized consultant, speaker, trainer, and author who has been helping people land new jobs for over 40 years. Learn more at www.resume-place.com.